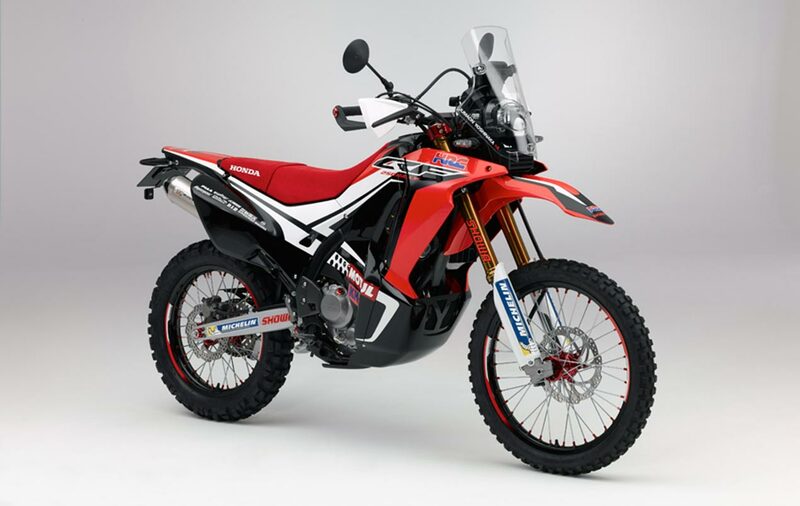 Earlier this year we showed you the Honda CRF250 Rally concept, the 250cc production equivalent to Honda’s rally raid competition machine, the Honda CRF450 Rally. That machine appears ready to move from concept to reality, as Honda has trademarked the name in both Europe and the USA, and we expect to see the lightweight adventure bike drop, sooner rather than later. Before you get your Dakar hopes up, the Honda CRF250 Rally is based off the Honda CRF250L, the more sensible sibling to the Honda CRF250R. This will mean less power for off-roading nuts, but it will also mean more palatable service intervals, as well as stone-cold reliability. The Honda CRF250 Rally make a good bookend to Honda’s latest adventure-tourer, the Honda Africa Twin. With a heavy 1,000cc machine, and now a lightweight 250cc machine coming to market, the clock is ticking until we see Big Red bring into production the Honda CRF450 Rally for regular blokes. We expect the ADV segment to really get excited about the CRF250 Rally, especially with all the clamoring in the comments about the current crop of ADV machines being too heavy for true off-roading.